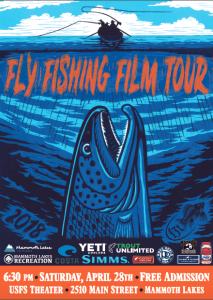 In Celebration of “Fishmas,” Mammoth Lakes Recreation and Mammoth Lakes Tourism is proud to bring you the 2018 premiere of the Fly Fishing Film Tour in Mammoth Lakes at the USFS Auditorium. This is a FREE event and we encourage all to join us for a fun evening of great films, raffle prizes and celebrate the opening of the 2018 Fishing Season. Time: doors open @ 6:30pm, show begins @7pm.